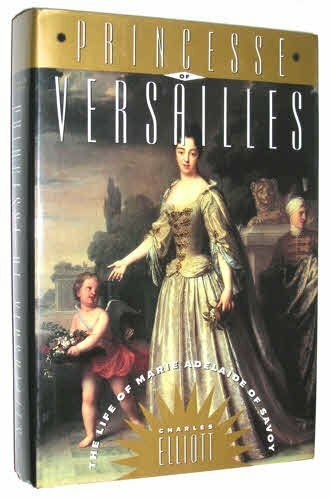 Princesse of Versailles: The Life of Marie Adelaide of Savoy is a 1992 biography, written by Charles Elliot, on the life of Marie Adelaide, Duchess of Bourgogne. In 1684, King Louis XIV of France arranged a marriage between his 14 year old niece, Anne Marie of Orleans, Victor Amadeus II of Savoy. Anne Marie fell madly in love her husband upon their first meeting but he would always be cold distant towards his wife, himself having many mistresses.Anne Marie's first child was born on December 6. 1685 and named Marie Adelaide. Anne Marie disliked the hedonistic lifestyle of the Savoy court and instead opted for a more relaxed environment with Marie Adelaide and her younger sister, Maria Luisa, at Vigno di Madama. As a result of the Treaty of Turin in 1696, Marie Adelaide became engaged to Louis XIV's grandson. The Treaty of Turin was an agreement by Victor Amadeus and the Sun King for the former's support in the Nine Years' War. The Duke of Savoy was famous for his perpetual shifting in allegiances. It was decided that Marie Adelaide would come to France, despite her younger age, in order to transition from a Princess of Savoy to a French one. Louis XIV and his secret wife, Madame de Maintenon, became enraptured with the darling Princess the moment they laid eyes on her. Marie Adelaide was educated at the Maison Royale de Saint-Louis, a girl's school founded by Madame de Maintenon. Marie Adelaide's intended was Louis, Duke of Bourgogne, the son of the Grand Dauphin and Marie Anne Victoria of Bavaria. As a child, the Duke was incredibly difficult with no respect for anyone whatsoever. It was thanks to his tutor Francois Fenelon that he was able to become the serious minded heir that France needed. Marie Adelaide and Louis married on December 7,1697, when the bride was 12. Because of the Princess's young age, the marriage was left unconsummated for 2 years, very much like it was before they were married. But the limited time that they had together was enough for Louis to become smitten. He nicknamed his wife "Draco", the latin word for Dragon. The Duchess of Bourgogne's presence at court was like a breath of fresh air as she was able to bring happiness and mirth to the aged King. She developed a love for theater and did a few amateur productions where her husband even chimed in. But her great love was gambling. Again her husband joined in on the fun but after Marie Adelaide fell deathly ill, his conscience kicked in and he abstained from the gambling tables henceforth. Despite Bourgogne's intense love for his wife, Marie Adelaide did not necessarily reciprocate his feelings because she found his piety rather boring. Both husband and wife had a deep love of practical jokes and unfortunately for the husband, he was sometimes be his wife's poor victim. Because of his deep piety, Bourgogne, with all of his amorous Bourbon tendencies, never strayed from his wife and in fact had a terror of his wife's ladies-in-waiting. One night Marie Adelaide announced loudly to the court that she was set to retire for the night. Her husband followed close on her heels. Once inside the room, Marie Adelaide had a friend of hers jump into the bed with the covers of her head while the Duchess hid behind the curtains. When the Duke of Bourgogne entered the room, he blew out the candle and quickly went to work. When things were getting heated, Marie Adelaide jumped out from the behind her curtains and accused him of cheating on her. The Duke was at first flabbergasted but soon after that became very mad and began to beat the hapless lady in his bed. All the while his wife laughed in the background. After a previous pregnancy ended in a miscarriage, Marie Adelaide gave birth to her first child, given the title of the Duke of Brittany, in 1704.The short lived younger Louis died a year later of convulsions. His death devastated his parents and the Duke and Duchess of Bourgogne became closer as a result. The next Duke of Brittany was born in 1707 much to France's joy. Another son was born in 1710, given the title of the Duke of Anjou, and he would prove to be his Mother's favorite. With two boys in the stray, the Bourbon dynasty seemed secure far into the future. In 1700, the Duke of Bourgogne's younger brother, Phillip, whom Bourgogne was especially close with, became King of Spain. Another contender for the Spanish throne was Archduke Charles of Austria (later Holy Roman Emperor). The ensuing battle for the Spanish crown would be known as the War of Spanish Succession. In 1708, Bourgogne was given command of the army in Flanders. His command left him in conflict with Louis Joseph, Duke of Vendome, one of the greatest French commanders of all time, whom Bourgogne later brought disgrace too. It was the longest of their many separations and Bourgogne wrote faithfully to his wife daily. And at first, Marie Adelaide replied with equal earnest (She once wrote a letter to him in her blood which delighted him beyond belief) but it was during this time that the Duchess of Bourgogne began intriguing with two separate gentlemen. Her relationship with said men probably never progressed beyond flirting but none the less tongues began to wag. Even Bourgogne noted that something was wrong when her letters to him became less and less frequent. The affair ended when things got out of hand at the intervention of Madame de Maintenon. One of the gentlemen she was involved with would later commit suicide. The Duke of Bourgogne's return from the front caused the relationship between the couple to change. Now Marie Adelaide began to appreciate her husband's steadfastness and soon she returned his feelings for her with full force. The couple and their young family was happy. In 1711, le Grand Dauphin died, aged 49. making Bourgogne and his wife only a step away from the throne. As the new Dauphine, Marie Adelaide began to settle down on her wild gambling and partying lifestyle, trying to set a good example for the court. The court traveled to Fontainbleau in early 1712. It was there that Marie Adelaide became ill. It turned out to be the measles. She succumbed to the disease on February 12, 1712. Her husband was absolutely distraught. He had already caught the disease and died less than a week later. The Duke of Brittany soon followed his parents to the grave. Only little Anjou survived because his governess had locked him in a room to spare him from the doctors. If Bourgogne was devastated by Marie Adelaide's death, it was nothing compared to The Sun King's reaction. The bright light of his life was gone now and for the next two years Versaille was in despair. Anjou became Louis XV of France on September 1, 1715. I give this book 4.5/5. I've already made a Youtube Video on Marie Adelaide but I still didn't know that much about her. This book really opens my eyes to who this wonderful woman really was. I'm a sucker for royal romances and while I was glad to share their love in my video, I don't think I properly captured the couple's dynamics. It wasn't just a boy meets girl and they fall in love (although it certainly was that way for Bourgogne), it was more complicated than that and that's what made it beautiful to me. While the book starts off a little boring and the Treaty of Turin lasted roughly a chapter when the books starts exploring Marie Adelaide's relationship with her husband that's when it hits its stride. I must admit that by the end the book had me tearing up a little.